Filming began on the Doctor Who 2013 Christmas Special on Sunday, and the cast crew were spotted on location in Wales earlier today. 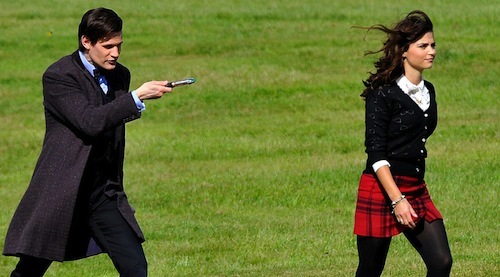 Both Matt Smith and Jenna Coleman were pictured filming the sixty minute special which sees the end of the Eleventh Doctor era and says a figurative "Hello" to Peter Capaldi as The Twelfth Doctor. See a fantastic gallery of pictures from today's filming HERE. The, as of yet, untitled episode is written by current showrunner Steven Moffat and is directed by Jamie Payne (Hide) and will see an appearance by the Cybermen. This story also sees Matt Smith wear a "wig" for his role as the Time Lord.